Hell in the Heartland: We work with The Dead Files & we're here to help..well sort of. At this point in our saga, we realized we had a serious problem that is growing stronger with each passing day. Jennifer and I decided it's was time to do something. That meant putting ourselves out there to the paranormal world. We were reluctant but understood we're dealing with something not of this world and we needed experts. We decided our best course of action would be to contact The Dead Files. We felt comfortable enough with the show and felt they wouldn't be like all the other ghost hunters or thrill seekers. We needed answers and help; we needed to know what we were dealing with before it got really ugly. The novelty of living in a "haunted house" had worn off. Submitting our story was difficult because at the time, the Travel Channel didn't have a very good case submittal site for the show. After searching the internet we finally found a Dead Files submittal page. We described our story in great detail and within a couple of days I got a call from someone. 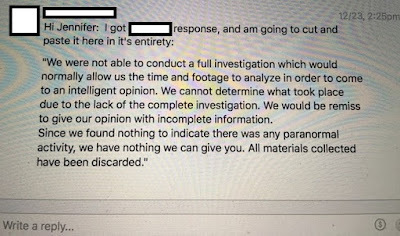 She said she represented a local paranormal investigation team and was hired by the producers of The Dead Files to do "the preliminary investigation" (lie #1). She claimed to be a psychic medium and had worked with Amy Allan in the past (lie #2). I was reluctant to talk to her but did so anyway after she told me they had done a lot of these investigations because the show wants to know if a place is haunted or not. That way they didn't waste time and money investigating nothing. Since I didn't understand how shows worked, I thought okay-seems reasonable. We sent her some of the pictures we have (see Party Crashers) and the video of the toy. We also told her everything that had been happening. She began to ask me some off the wall questions. What are my religious beliefs? How often do you attend church? Are you and the rest of your family baptized? Do you consider yourself religious and do you pray? Although I considered these questions kind of judgmental and inappropriate, I answered them anyway...because like I said, we had never done this before so we didn't know exactly how the show worked from a logistically standpoint. They came out in early October. They went over what they are going to do and what they were looking for. Jennifer asks them specifically what they are going to do. 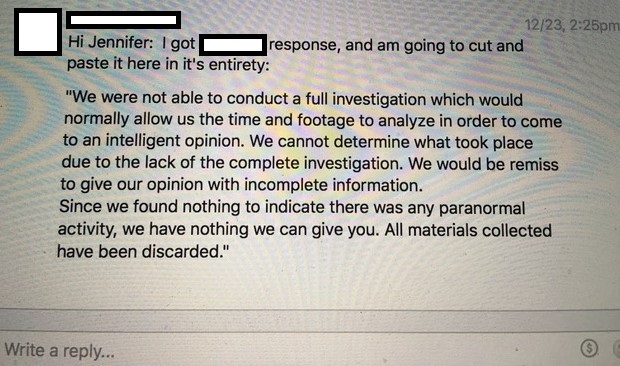 They tell us they are only there to document and send their findings to The Dead Files (lie #3). They have us sign releases and they begin setting up. Their set up took about 1 1/2 hours. Microphones, cameras, wires everywhere, and hand held digital recorders. They seemed a little too carefree and cracking jokes, but again, I didn't know what to expect. Half the team set up a base in the garage and the other half continued to set up inside the house. 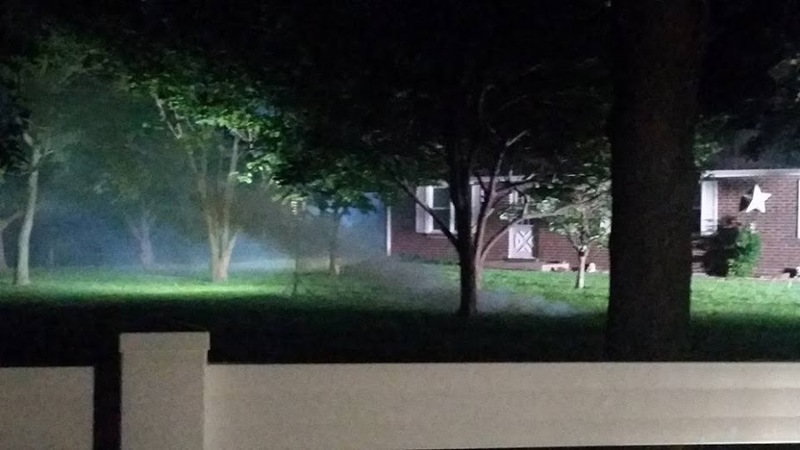 During the house set up, there was an overwhelming smell of cigarette smoke. It was like being in a smoking room, it was that bad. None of us smoked and neither did anyone in the group so there was no reason for it to be there. The psychic began to walk the house and she tells us the basement had a strong and dangerous feel to it. She described it as demonic and angry. So, of course the team wanted to investigate that first. They asked me to go down into the basement with them. It's myself and four members of the team. They begin asking questions-basic ones, nothing malicious. I could sense a change in the air, it was thicker and it was getting a little harder to breathe. After a while we head back upstairs. They listen to the recordings...nothing. The group leader ask us to go back down stairs and told the members to try and "draw it out." I remember him specifically saying that because in my mind I questioned it. As we are making our way back down into the basement, I can feel the pressure again. My anxiety level was getting higher; I felt tense and nervous. They decided the best course of action was to sit in a circle on the floor! I immediately asked if they thought this was the best thing to do as being on the floor made us vulnerable. They assured me it would be fine and they did it all the time. As we are sitting there in the dark, in a place I hate, the group member with the recorder starts asking questions in a demanding tone. "Who are you?" "Tell us your name!?!". As she keeps asking questions, I feel a tug on the back of collar and I jump a bit. I tell them something just grabbed me. One of the members ask, "did you just do that?". I then heard a voice behind me say "YES!" I felt a slap and cutting pain on the back of my neck. I jumped up and ran to the stairs, one of the members practically tackles me before I can make it. He shines a flashlight on the back neck and says 'we got scratches!'. I break away from him, run up the stairs and out into the garage to Jennifer. Apparently they didn't know the difference between simple scratches and gouge. I three slashes on the back of my neck. One of them was actually bleeding. I was beyond terrified. Nothing like this had happened before, I had never been attacked or hurt. I was having a difficult time calming down and didn't want to go back into the house. I also didn't want to talk to any of the group members. I cannot pinpoint why but I had these feelings of angry and hostility toward them and they very strong feelings. The activity in the house had gone to a new level. A level of violence and lashing out. It was now controlling emotions and capable of physically harming people. They asked me if I would go back down to the basement but I refused. Some group members, along with the psychic, decided to go back. They came back up and the group leader asked the psychic if she felt anything. She pulled him aside and I overheard her tell him something is down there and it's evil. I could see the fear in her eyes. I remember waking up on the floor and I thought I had passed out. The team members where screaming and terrified but I felt calm and relaxed. I got up and walked upstairs calmly despite the chaos around me. Jennifer meant me upstairs in a panic. She asked if I was okay and the other group members asked me the same thing. I told them I felt fine. Jennifer then told me I was picked straight up and thrown up against the wall! She said they all saw it on the monitor. The group leader decide he would personally go down and investigate with two other male members. After about 5 minutes, he radioed to the rest of the group. "we're shutting it down, it's not safe here"
Jennifer and I were dumbfounded. Jennifer told the group leader, "NO NO NO! You're not just going to come in here, piss this thing off and leave! We have to live here!". They reluctantly agreed to do a cleansing and the psychic sages the house. I thought to myself, "really, that's it? That's all you do to cleanse?" I felt she was doing it wrong but didn't understand how to do it myself so I falsely trusted her. As we talked and asked questions on what should we do, the light above us got brighter and brighter. The bulb then burst. The psychic medium told us we should delete everything and burn any evidence we had as the spirits could be attached to those things. We did so immediately but some of the things were saved in an automatic back up system we had. Before they left they told us they would be in contact with us in a couple of weeks about what they found (lie #4). They left faster than a criminal who just robbed a bank. Jennifer finally called them because we hadn't heard from them at all. They told her that they didn't find anything during their review and that the evidence was inconclusive! (lie #5) They said they deleted everything (lie #6). A Message Jennifer got from the team leader via a team member. The team leader refused to respond to our calls or message. I reached out to the psychic via email since she was our original point of contact. Her response to me was condescending & chastising. She said we were to blame for our problems because she felt we were not religious and that we had not accepted Jesus into our lives. She said our prays lacked soul and we let the evil into our house. I asked her about the evidence being submitted to The Dead Files and she told me that they wouldn't be doing so. (lie #6). That was the last I heard from her and the group. After the cleansing, our house did feel calmer but that was nothing more than an illusion. The group had unleashed the evil and turned it lose on us. We were about to pay the price for their incompetence. That so messed up. Did you ever get help? What they did was inexcusable. I am so sorry that they used you like that. They certainly made our situation worse. How infuriating to have been so endangered by those self serving thrill seekers! There are a lot a great teams out there who are really wanting to help. However, on the flip side, there are a lot of people who have no business trying to help others. I'm so sorry you are still having issues and the fact that the team you had to come and help did nothing but make your situation worse. Don't give up as there are many people who can help you. I would find a metaphysical store and go and talk to them. They can guide you in the right direction. Also, by all means, if you haven't submitted your case to The Dead Files please do. We have a link to their submission page under Links We Like on the left hand side. Just click on Help Me Dead Files. Please let us know if there is anything we can do for you. Be strong! Losing Control & Hello Charley! Death, The spoon, and The Crazy Girl.